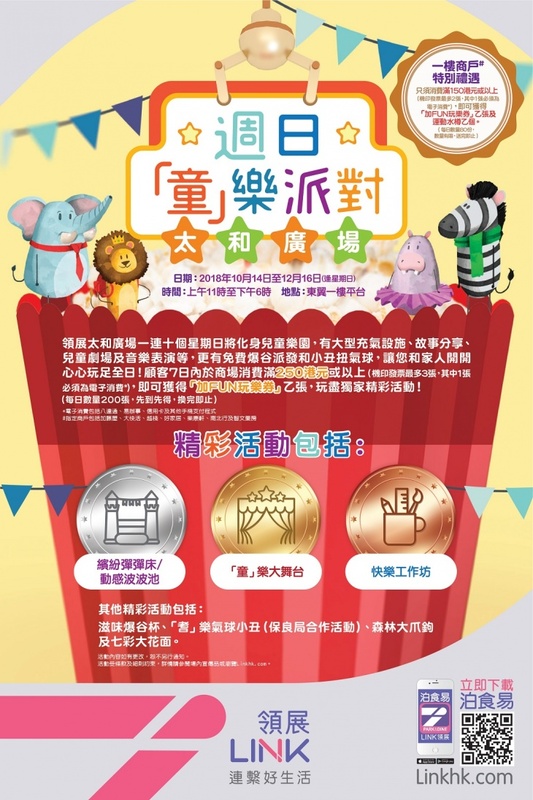 For 10 Sundays, Tai Wo Plaza is transforming into a children's paradise with large inflatable facilities, story sharing, children's theater and music performances, as well as free popcorn distribution and balloons twisting clowns. Starting from 14 October 2018, customers with $250 HKD or more accumulated spending in Tai Wo Plaza within 7 days (maximum 3 original machine-printed receipts, with at least 1 electronic payment receipt*) and customers with $150 HKD or more accumulated spending in designated shops on Tai Wo Plaza 1/F# within 7 days (maximum 2 original machine-printed receipts, with at least 1 electronic payment receipt*) are entitled to receive a "double FUN ticket" for exclusive activities**! (daily quota 200, on a first-come-first-served basis, while stock lasts). Customers who spend in designated shops on Tai Wo Plaza 1/F# are also entitled to receive an aluminium water bottle (daily quota 80, on a first-come-first-served basis, while stock lasts).